Home Solutions Midwest is a BBB accredited, licensed and award-winning contractor that excels in awning installation, window installation, siding installation, door, gutter installation and many other types of work. At Home Solutions Midwest we offer many high quality and affordable awning installation styles and options that will save you a lot of money in unexpected repair bills over the long haul. Make sure to view our very satisfied customers in your local neighborhood by viewing our before and after pictures and customer reviews. Get a FREE estimate today on an awning installation or any other service by clicking the FREE estimate button below. Founded in 1981, Sunesta is a pioneer of the awning industry and one of the first companies to manufacture custom retractable awnings. All of Sunesta’s products are 100% manufactured in the U.S. and made to order. Sunesta offers custom retractable awnings for decks, patios, and outdoor living areas, as well as window and door awnings. Convenience - Fully or partially extend or retract with the push of a button or turn of a handle. Full view - Streamlined design without support poles means your view isn't obstructed. Unique style - Each Sunesta awning is made to the distinct needs and style of each homeowner. Expanded living space - Sunesta retractable awnings add a customized outdoor room. Protects furnishings - Prevents the sun’s UV rays from damaging furniture, carpet, upholstery, drapes, and flooring. Saves on utility costs - On warm days, an awning blocks the sun from entering your home and on cold days, the awning can be retracted to allow the sun to help heat your home. No matter what reason you have for installing an awning or what type of building you want to match it to, we have the perfect awning to fit your needs. Our experienced professionals will work with you to find the perfect awning to fit your needs and match your home or business. 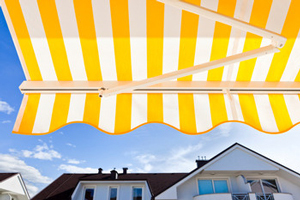 Contact us today for a free estimate on any awning service! 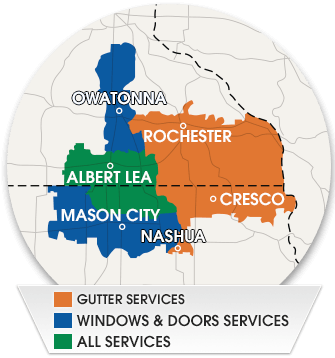 We are your local awning contractor, serving Mason City, Northfield, Rochester, Owatonna, Winona, Faribault, Austin, Northfield, Albert Lea, Farmington, and the surrounding areas.